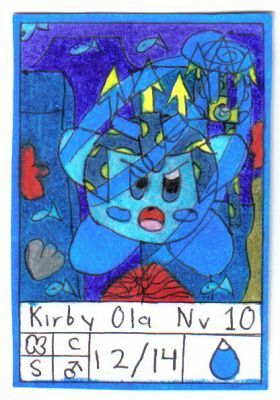 Wave Kirby Lv 10 is the advanced form of Wave Kirby Lv 5. Apart of be one of the best abilities for the sea, it is very cool and great because with this ability you can control any submarine stream, for example, sometimes in the kirby`s games when you travel in a water world normally exsist streams that drag you but with the Wave power you can change the direction of this stream and it take you to the place where you want stand. Also this ability create giant sea tornados that allow absorb all enemies in a region. For the moment, doesn`t exsist a enemy or helper that use this ability but if you have an idea of the helper, tell me. In this level he is using an attack called: Wave Spin. I think in create a enemy that gives this ability but the first form of Fatty Whale doesn't give it. In the future i create the helpers of the new abilities. Is a pleasure that you like this ability, this is one of my favorite abilities too. But if you have an idea for a helper for this or another ability call me. Wait, you mean I could suggest abilities? Cool! How about Dark Kirby, because there's Light Kirby. His helper could be Koozer or you could make a new helper. Or Cloud Kirby, his helper would be Kracko Jr. or Loud. Good Idea, although in KAA and KTCG appears a creature called Dark Kirby (evil version of Kirby), he is a villan in the game, for that i can't use Dark as a ability. Cloud Kirby remember me my Weather Kirby, another ability that appear in both games. In the future i upload him, but actually i don`t know how create his hat. I had an idea for the Cloud hat, can I upload for you? Oh yeah that reminds me, I was making up fan games, and Dark Kirby was one. It's probably better off that way anyways, evil. , i can't wait to see your Fan Games and your art. Aaak! I'm not making a fan game! I don't have the software! Well, I'll do some art I guess, now that you like it... I'm making a few people in KRR on it, like characters, you can be another main one. I'll start the Cloud hat tonight, and the powers, if you don't mind. I can't wait for see them. for some reason Wave Kirby reminds me of Wave Man from Megaman five, was this similarity intentional? Also, I like the idea of a Wave Kirby, perhaps the enemy would be a wave that rides atop of the water in certain areas. Time ago i created this ability but didn't have idea how create the hat, one day i played Megaman 5 and i saw Wave Man, he inspires me to create the hat. Thanks for your comment and for you idea, possiblely the enemy of this ability would be a wave. Thank for the idea again and thanks for enjoy KTCG.